Free Shipping Included! Thomas Ferguson Men's Linen Corded Handkerchiefs with Hand Rolled Hem (Set of 3) 16.5In Sq White by Thomas Ferguson Irish Linen at Mas Fashion. MPN: BH177. Hurry! Limited time offer. Offer valid only while supplies last. The Thomas Ferguson Irish Linen Mens Linen Corded Handkerchiefs Features a Hand Rolled Hem and Includes a Set of 3 Handkerchiefs Quality Gift Box. 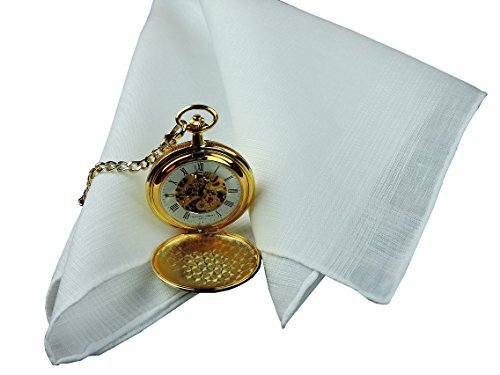 The Thomas Ferguson Irish Linen Mens Linen Corded Handkerchiefs Features a Hand Rolled Hem and Includes a Set of 3 Handkerchiefs Quality Gift Box. The Handkerchief Size is 42cm x 42cm (16.5in x 16.5in) Square. Watch accessory not included. The corded border runs around the four sides of the handkerchief, and is composed of cords made from heavy 3-ply cotton which stand out from the ground linen yarn. This is a subtle, but effective design technique. The Thomas Ferguson Irish Linen company, bears the name of its founder, Thomas Ferguson and has been offering quality Irish linen to customers since 1854. Today there are still a few weavers weaving plain linens for apparel, but Thomas Ferguson is the only Irish linen damask weaver still remaining in the whole of Ireland weaving traditional Irish damask table linen. This high quality handkerchief is also a perfect gift for the groom-to-be, his wedding party and other very special guests in the wedding. If you have any questions about this product by Thomas Ferguson Irish Linen, contact us by completing and submitting the form below. If you are looking for a specif part number, please include it with your message.